Two budget experts - a Democrat and a Republican , both former Hill staffers - say playing games of political chicken when it comes to the fiscal cliff is a 'lunatic' strategy. Charles Konigsberg, policy chief of NEMA, was the director of the Domenici-Rivlin Bipartisan Debt Reduction Task Force and served as assistant budget director in the Clinton White House. G. William Hoagland, vice president of public policy at CIGNA, was Republican staff director of the Senate Budget Committee for nearly 20 years. 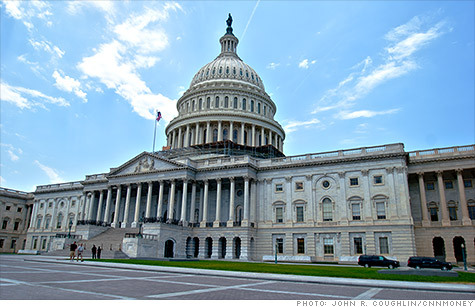 Congress and the White House face a clear choice on the "fiscal cliff." They can go over it and push the economy into recession in 2013, as the nonpartisan Congressional Budget Office and the International Monetary Fund have projected. Or they can avoid it. If they do, CBO projects GDP growth of 4.4% and more than 2 million new jobs in 2013. Unfortunately, the high-stakes game of political chicken currently under way in Congress is increasingly viewed as "good strategy." It is a lunatic strategy. The fiscal cliff is a "perfect storm" of tax, spending and debt deadlines at the end of 2012. The most significant are the expiration of the Bush tax cuts, the onset of automatic budget cuts and raising federal debt ceiling. The Bush tax cuts expire on Dec. 31. Republicans want to extend all of them. President Obama and congressional Democrats want to extend them for most Americans but let them expire on income over $250,000. Without a negotiated compromise, everyone's taxes will go up, affecting the middle class and seriously dampening consumer spending. We also face damaging, across-the-board spending cuts of 8% to 10% in nearly all defense and non-defense programs on Jan. 2 unless Congress acts. These automatic cuts are mandated by the Budget Control Act, which grew out of last summer's debt ceiling negotiations. The cuts were triggered by the failure of last year's congressional "super committee" to develop a long-term debt reduction plan for the nation. These severe austerity measures -- along with others that make up the fiscal cliff -- will further weaken the recovery and threaten national defense. Our nation's leaders have legitimate differences of opinion on tax policy, spending, infrastructure investment, and how to resolve our long-term debt problems. And they should debate these issues vigorously during the fall election campaign. However, Congress and the administration should act now to avoid the cliff. They won't have enough time to do so if they wait until the brief lame duck session after the election. Direct the relevant committees of Congress to report entitlement and tax reform legislation by July 4, 2013, to reduce debt held by the public to 70% of GDP within a decade and 60% for the long term. The entitlement and tax reforms necessary to stabilize our long-term debt are by no means "easy," as some politicians have suggested. But the bipartisan Simpson-Bowles and Domenici-Rivlin Commissions together offer a combination of solid reforms that achieve the required debt reduction. These two actions -- eliminating the fiscal cliff in the short-term and stabilizing the debt for the long-term -- must be linked to be credible. Together, they would strengthen our economic recovery, maintain our national defense and achieve long-term fiscal stability.